Fried zucchini is scrumptious, but time-consuming. The long fat zucchinis, as one reader calls them, the ones that “got away”, make great sliced discs, perfect for frying. From a time standpoint, fried zucchini is, really, a summer time delicacy. The time required to slice those zucchinis into paper-thin discs, (grandma always says, the thinner the better) and bread them in the mixture of egg/milk and flour and salt takes a lot of time from a summer afternoon. On a whim, I decided to cut out that slicing and breading step by grating the zucchini, just as you would grate zucchini to use in a recipe for bread or cookies. Then I delicately added ¾ flour on top. I barely mixed this, as I wanted the flour to coat the zucchini, rather than make a batter. When the skillet was hot, I added a couple of tablespoons of olive oil, and I dropped the zucchini mixture by spoonfuls onto the pan and fried them just like potato pancakes. Once one side was nice and golden, I flipped the zucchini, and added grated Parmesan cheese on top to melt on each zucchini bundle. This method does not work, by the way, for fried green tomatoes… I tried…they need to cook more than a zucchini, and grating causes them to get bunched up and do not fry very well this way. So follow grandma’s advice for green tomatoes… the thinner the slices, the better. So, there you have fried zucchinis without all the extra work and fuss. 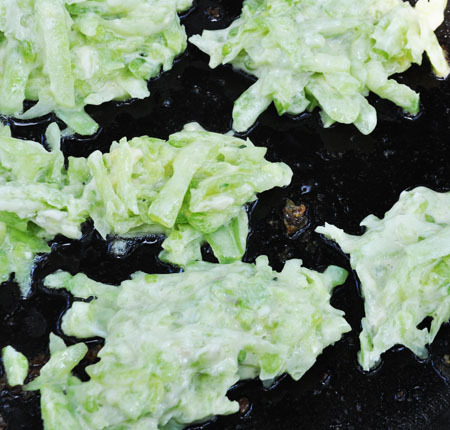 Plus, there’s a bonus to this fried zucchini method. You can go ahead and grate the fresh zucchinis from your garden, (or the cheap ones that are available right now in the produce section) and throw the grated zucchini into a zip lock bag into your freezer to use this winter for breads, cookies, and of course, this fried zucchini method. Zucchini pancakes! 🙂 We grate it here, stir fry it in a bit of olive oil, add some toasted almonds and sprinkle with grated cheese – yum! My first three plants have bit the dust, I’ve got two more that are just starting to flower, and two that are just starting to look like plants. With any luck we’ll have more zukes soon!